This wasn't your ordinary police pursuit. 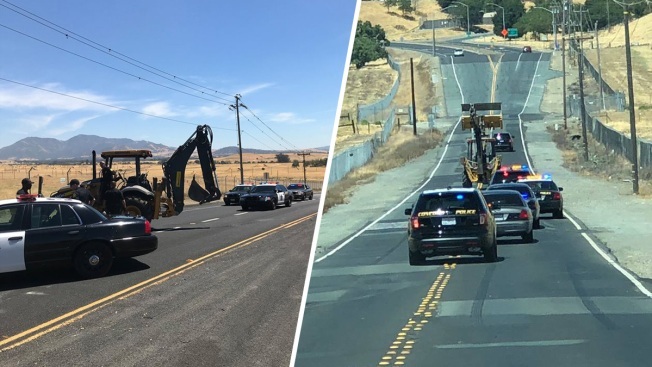 Concord police on Wednesday chased a 39-year-old Richmond man behind the controls of a stolen backhoe who was driving recklessly throughout the East Bay city, according to the department. He eventually stopped and was taken into custody. Concerned citizens started to call authorities just after 2 p.m. after spotting the backhoe operator wreaking havoc on city streets, according to police. Some callers wondered if the man was intoxicated. A sergeant with the police department eventually caught up with backhoe and tried to the make the man pull over, but the man failed to stop, according to police. Officers tailed the backhoe for about 20 minutes and managed to separate it from other motorists on the road, police stated. After cruising along Willow Pass Road, the man eventually stopped close to the entrance to eastbound Highway 4, which had been closed thanks to the California Highway Patrol, according to police. The man was arrested and booked for auto theft, evading law enforcement and obstructing arrest. Authorities eventually figured out that the backhoe had been stolen. Officers were able to return the undamaged piece of equipment to its rightful owner, according to police.